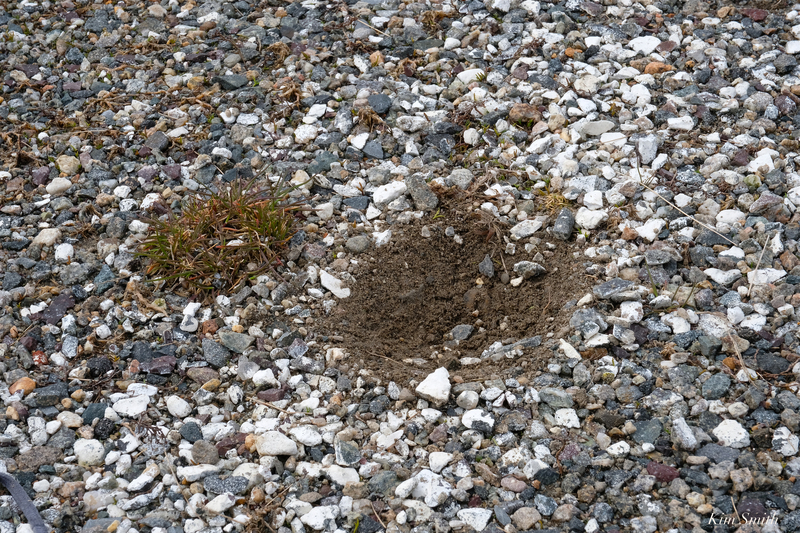 This past week, we have gotten a half dozen reports of “plovers” nesting in local parking lots. 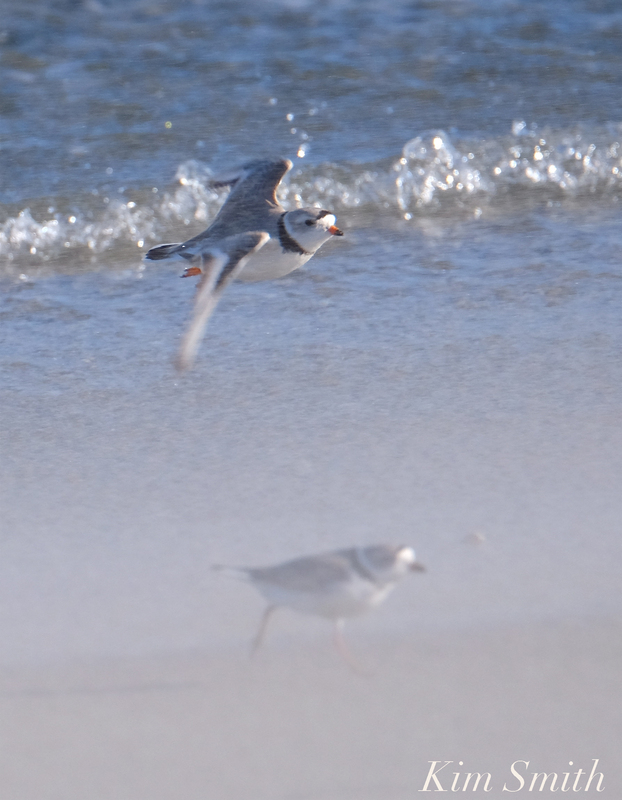 Folks are correct, they are a type of plover, but they are not Piping Plovers. 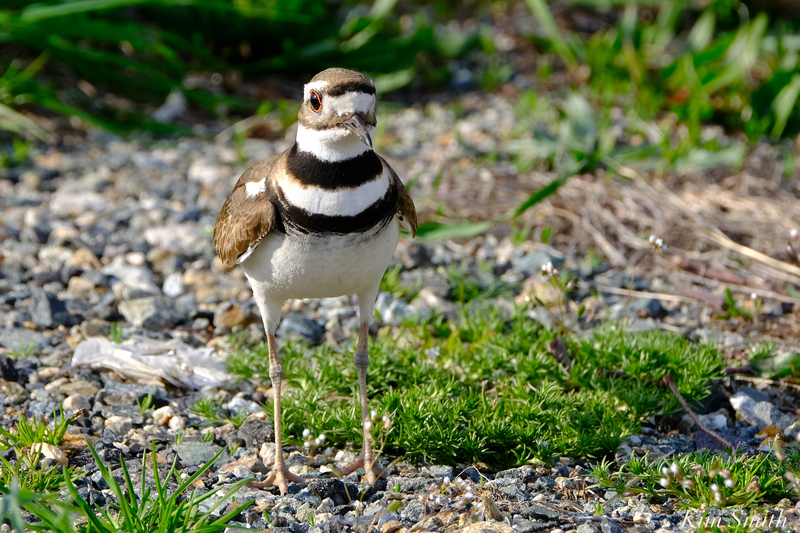 The bird is a more common sort, a Killdeer, and Killdeers, like Piping Plovers (and other species of plovers), share many similar courting, nest scraping, mating, and defensive behaviors. Killdeers have been nesting in the dunes and in the Good Harbor Beach parking lot for a number of years, and some years they even have two broods. Last year, the first brood of the season hatched from a nest in the dunes, the second brood, from a nest at the perimeter of the parking lot. For the second nest, Gloucester’s amazing DPW crew put up a large rock adjacent to the nest, to prevent cars from driving over the nest. 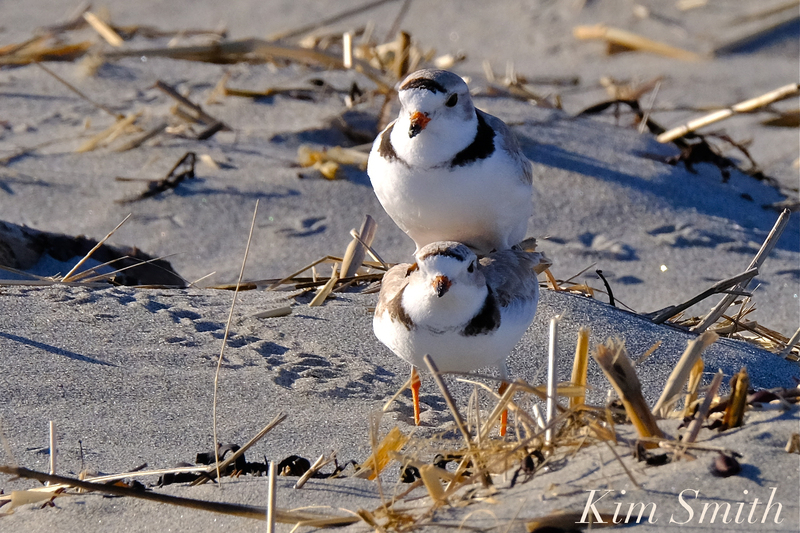 Killdeers are nearly twice as large as Piping Plovers, but you wouldn’t know that unless you see them side-by-side. The easiest way to tell the difference is Killdeers have two black collar bands whereas PiPls only have one. Killdeers have a red eye ring, two collar bands, and a black, longer bill. 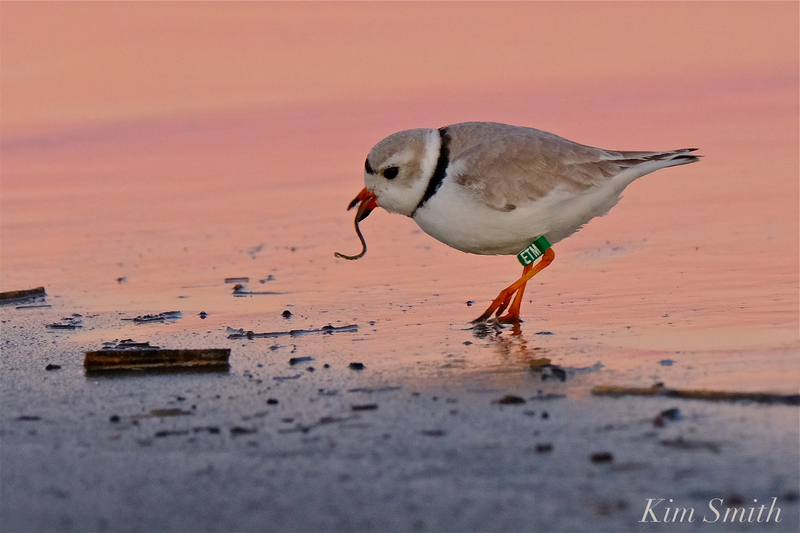 Piping Plovers have one collar band, no red eye ring, and an orange bill tipped black. The back and wing feathers of the Killdeers are a mid-shade of brown, with rust and orange under wings. This coloration more easily blends with gravel pits, grasslands, and scrubby dune habitats. 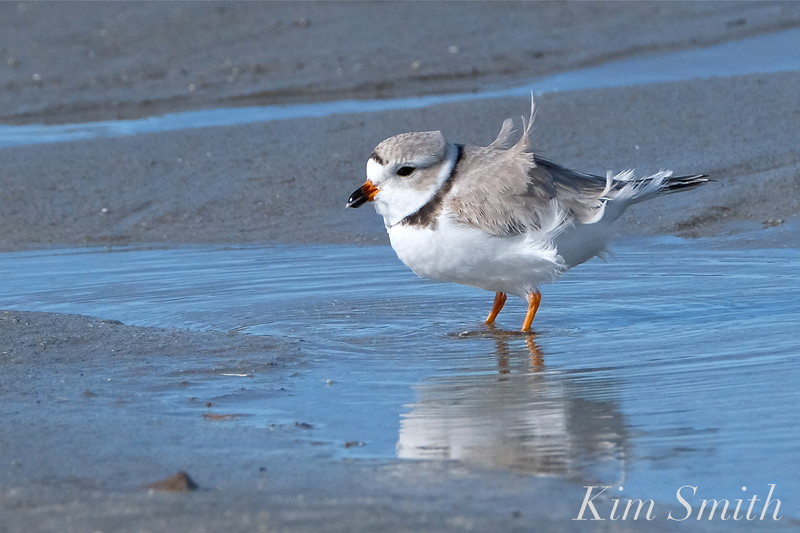 The Piping Plover’s wing and back feathers are a soft pale gray, in shades of driftwood and sand; the birds are much better camouflaged for beach life. 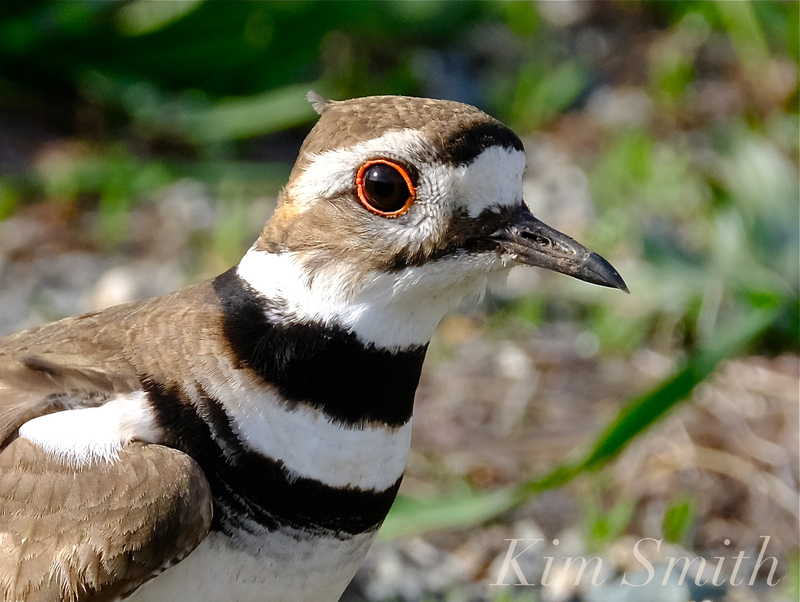 The Killdeer has a red eye ring, the Piping Plover’s eyes are jet black. Killdeer’s bills are more elongated and are a solid black, the PiPls’s is shorter and orange, tipped in black. 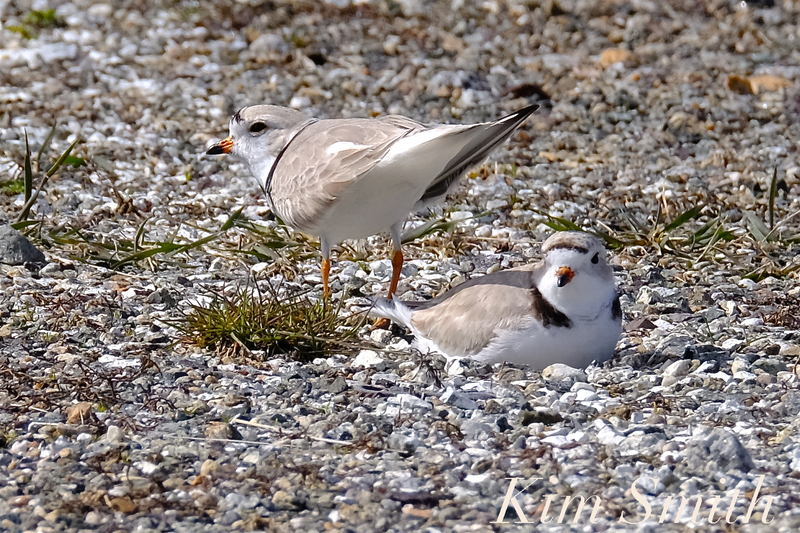 Piping Plovers have orangish legs; Killdeer’s legs are light buff and light gray. The feathers of the Killdeers at Stage Fort park blend beautifully with gravel, scrubby grass, and dirt found there in the parking lot. Notice in the third photo in the above gallery how the Killdeer blends with its grassy surroundings. 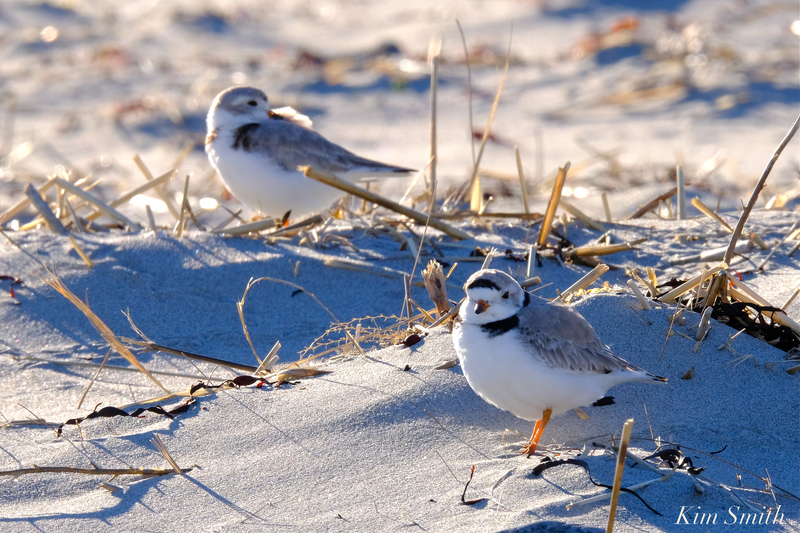 Piping Plovers are camouflaged in coastal hues of sand and driftwood. 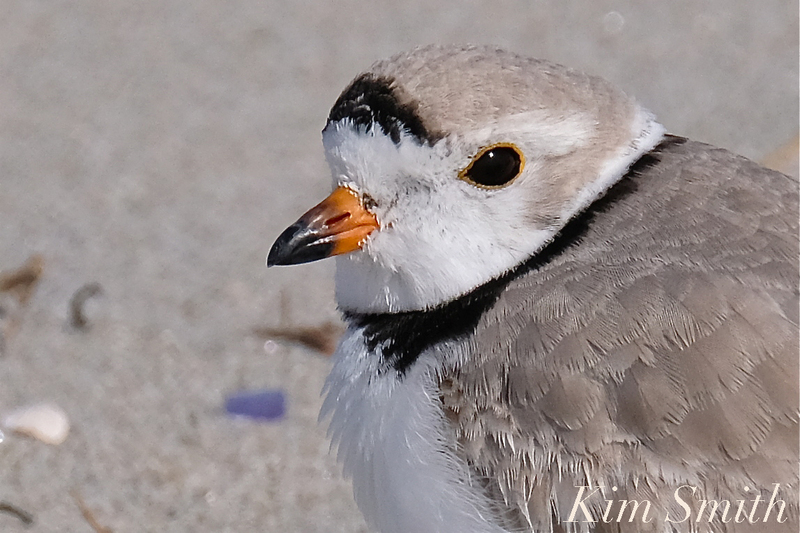 The same advice that applies to observing Piping Plover chicks as does to Killdeer chicks. Watch from a safe distance that does not cause the birds to flush and never pick up or touch the eggs or chick. 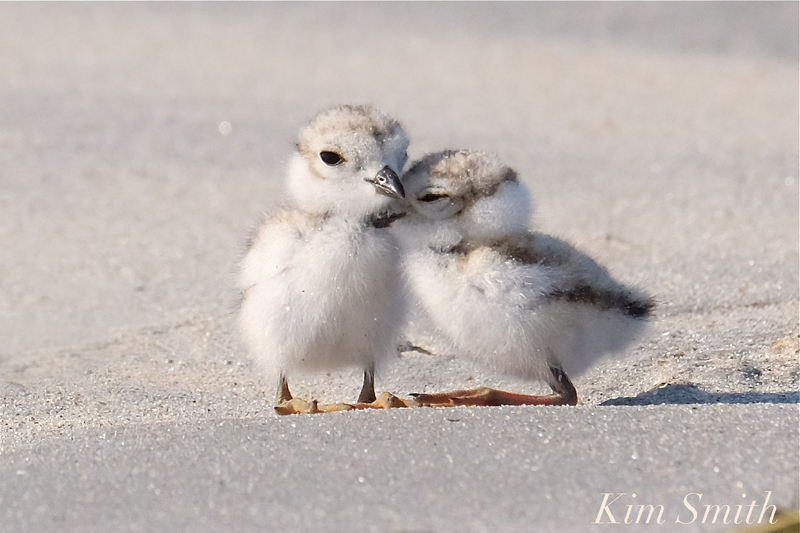 Killdeer and Piping Plover chicks are precocial. That is a word biologists use to describe a baby bird’s stage of development at birth. Precocial means that shortly after hatching, the bird is fully mobile. Plover chicks are not completely mature, they still need parents to help regulate their body temperature, but they have downy feathers and can run and feed themselves within moments after emerging. 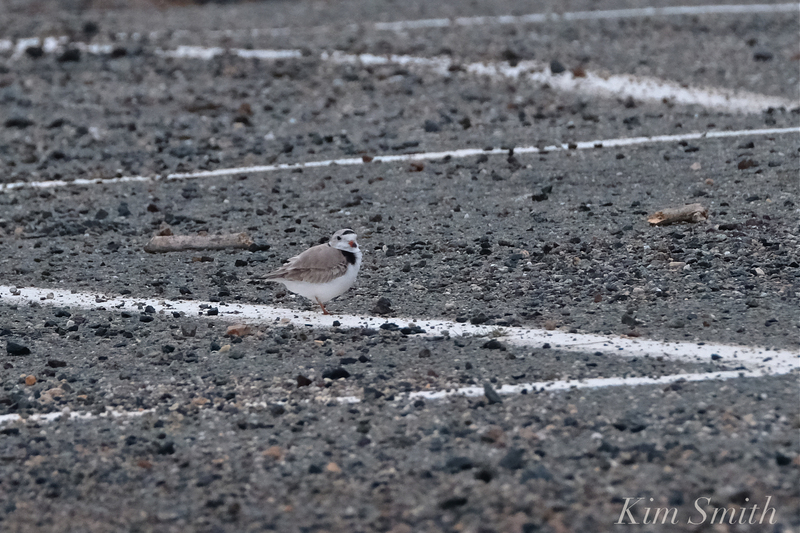 Both Killdeer and Piping plover chicks are well camouflaged in their natural habitats. The opposite of precocial is altricial. Birds that hatch helpless, naked, usually blind, and are incapable of departing the nest are altricial. Robins and Cardinals are examples of altricial birds. 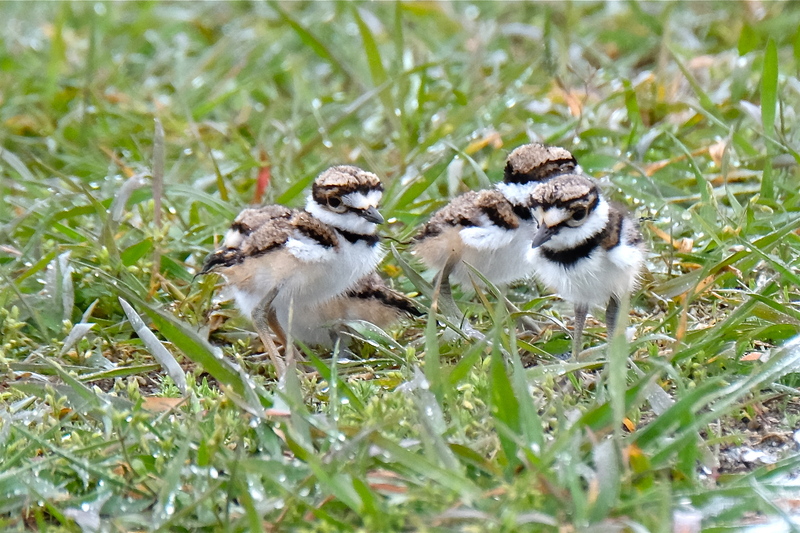 Killdeer chicks are well hidden in their habitats, as are Piping Plovers chicks in theirs. 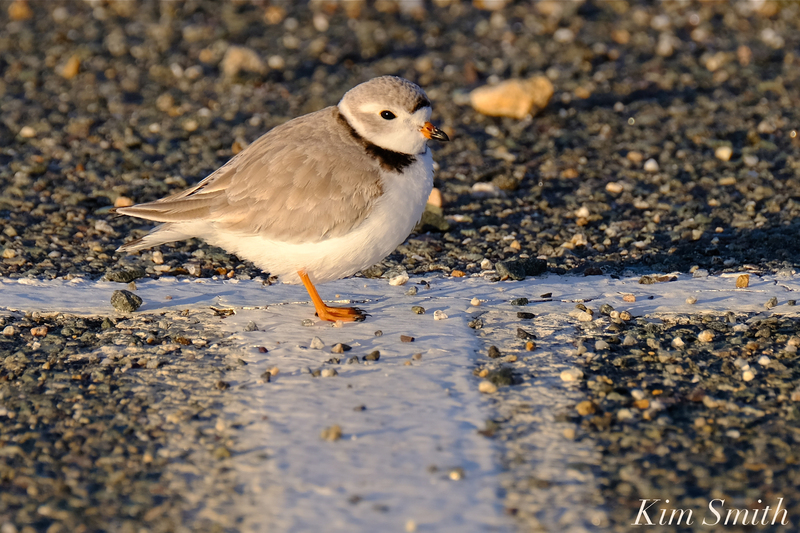 Even though they are not Piping Plovers, we still love to hear about Killdeers and to learn more about where they are nesting in our area. Please email me at kimsmithdesigns@hotmail.com if you have any information you would like to share about Killdeers. Thank you. 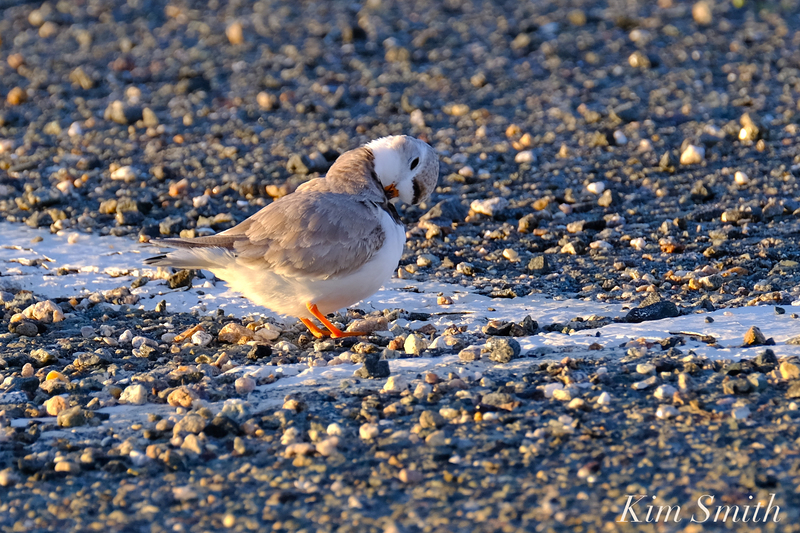 This entry was posted in #gloucesterplover, #sharetheshore, Birds, Birds of New England, Cape Ann Wildlife, Good Harbor Beach, Piping Plover, shorebirds and tagged #sharetheshore, Beautiful Birds of Cape Ann, beautiful Birds of Massachusetts, Charadriiformes, Charadrius melodus, Charadrius vociferus, Good Harbor Beach, Killdeer, Piping Plover, Stage Fort Park on April 24, 2019 by Kim Smith. 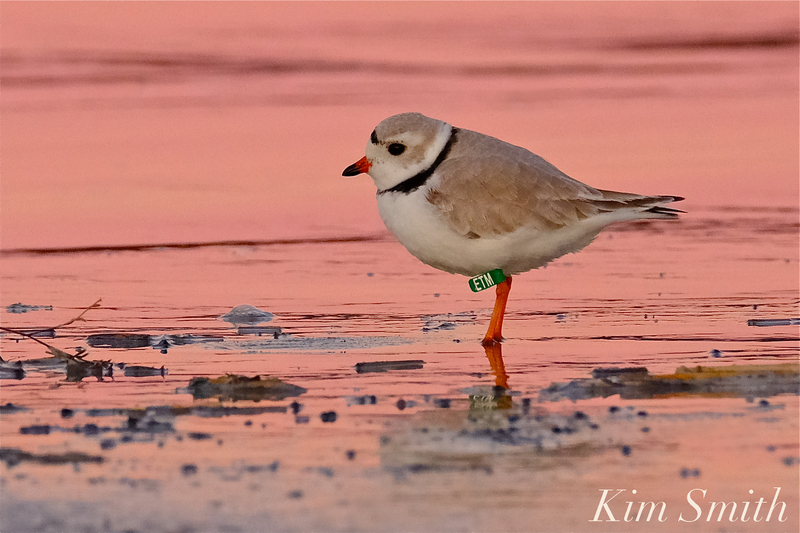 As you may have read, a banded male Piping Plover was spotted by Piping Plover volunteer monitor Heather Hall late afternoon on April 16th. 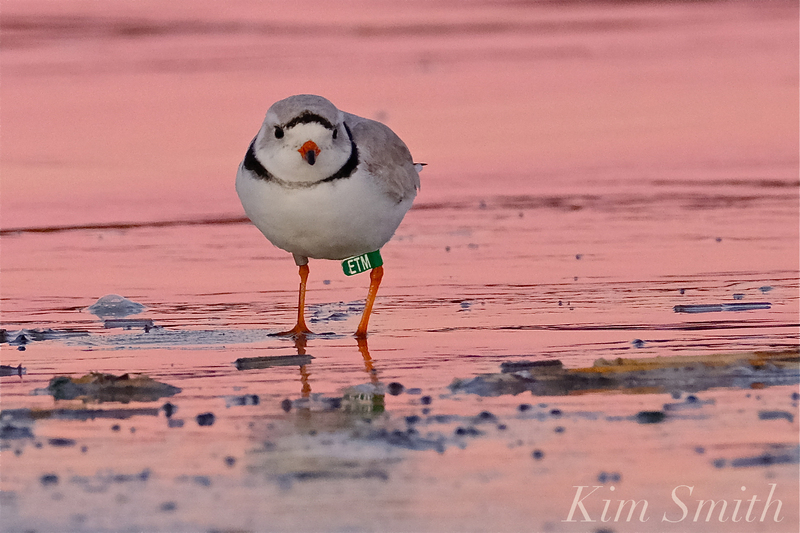 He was banded on October 7th, 2018, at Cumberland Island, Georgia. (Read more here). ETM has been spotted daily and often at Good Harbor Beach since the 16th. 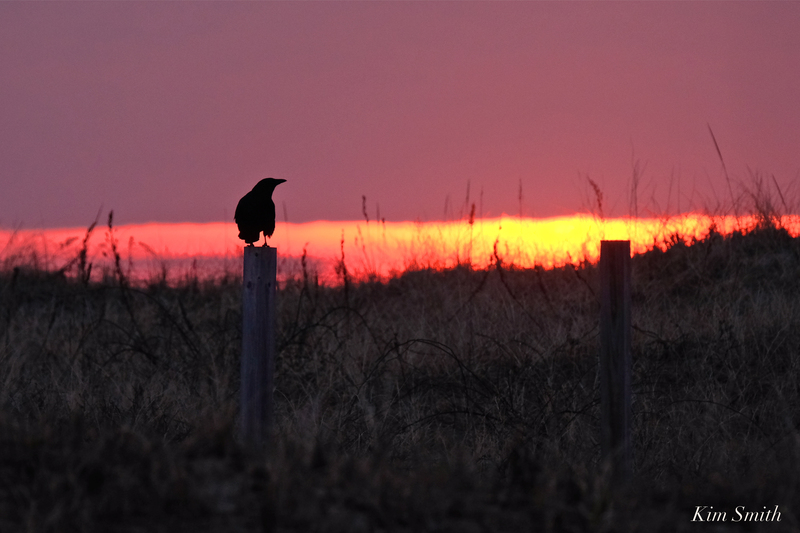 We’ve heard more from the Virginia Tech Shorebird Program biologists. 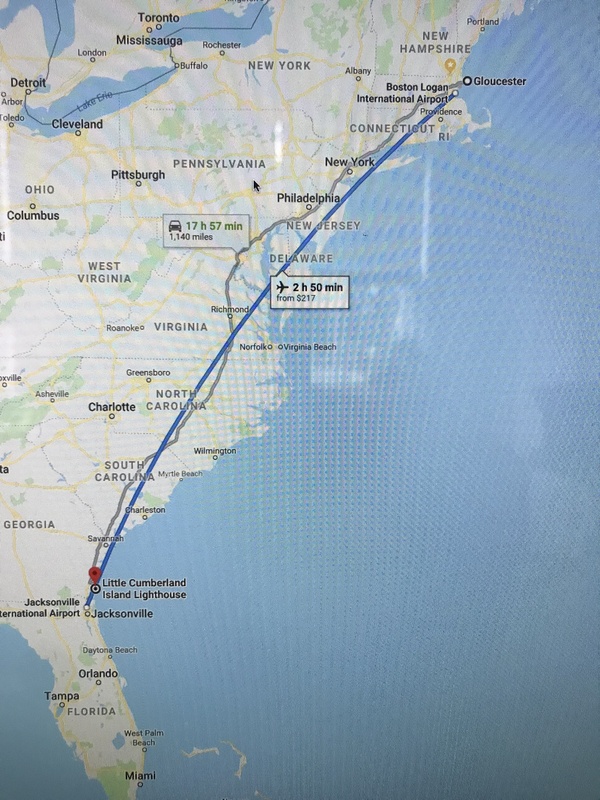 ETM was last seen at Cumberland Island on April 11th, which means that in five days, or less, he traveled all the way from Georgia to Gloucester, approximately 1,140 miles, if traveling by airplane and overland. If he were traveling along the coastline, that would greatly increase the mileage. 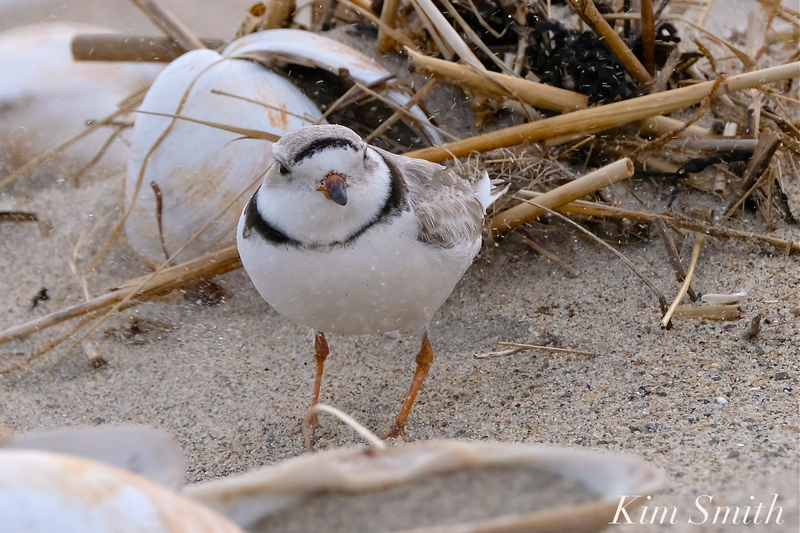 It’s no wonder that when we see shorebirds newly arrived at Good Harbor Beach in the spring, they appear weary and ravenous! 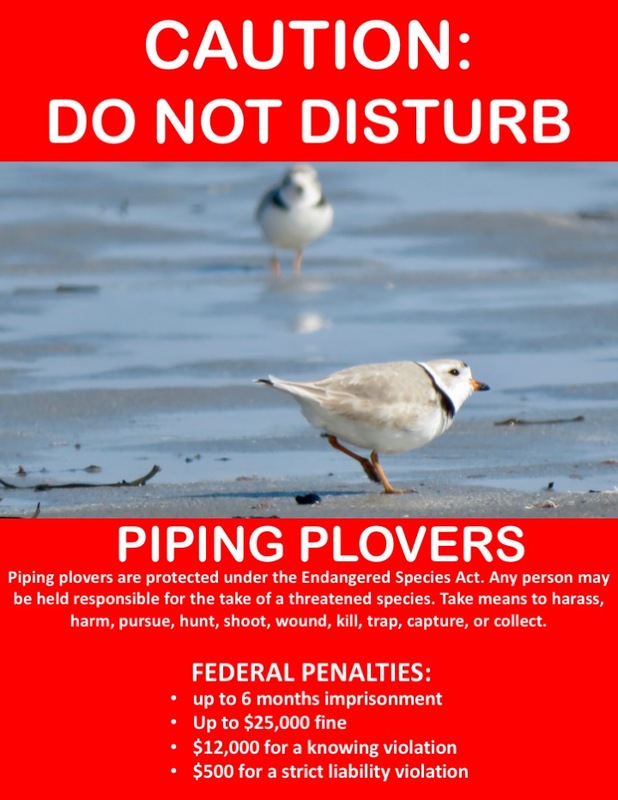 This entry was posted in #gloucesterplover, #sharetheshore, Birds, Birds of New England, Gloucester Plover, Good Harbor Beach, Piping Plover, shorebirds and tagged #gloucesterplover, #sharetheshore, Amelia River Cruises, banded bird, Banded Piping Plover ETM, Beautiful Birds of Cape Ann, beautiful Birds of Massachusetts, Charadrius melodus, Gloucester Massachusetts, Gloucester Piping plovers, Gloucester Plover, Good Harbor Beach, parking lot plovers, Piping Plover, Piping Plovers, Virginia Tech Shorebird Program on April 22, 2019 by Kim Smith. Our Good Harbor Beach PiPls are waffling between the parking lot and the beach. Tuesday at daybreak I found them mating and sitting in the nest in the parking lot. Standing at the crossroads- parking lot nest or beach nest? Papa and Mama courting at the parking lot nest scrape Tuesday. Mama (left) and Papa( right) in the parking lot nest scrape. 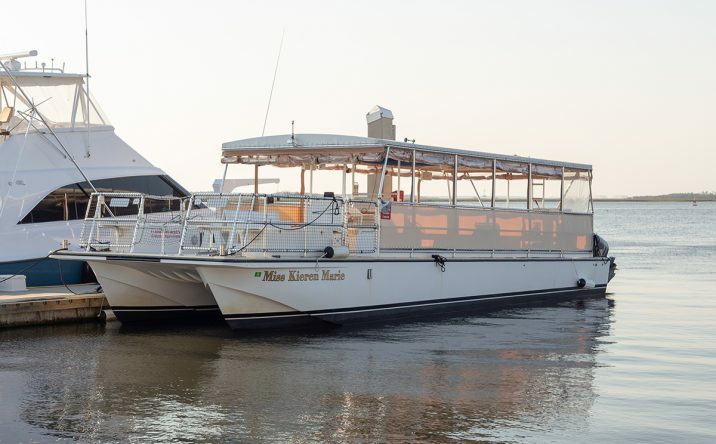 The painted white lines provide camouflage. Late Wednesday afternoon, the two were this time mating at their beach nest scrape. 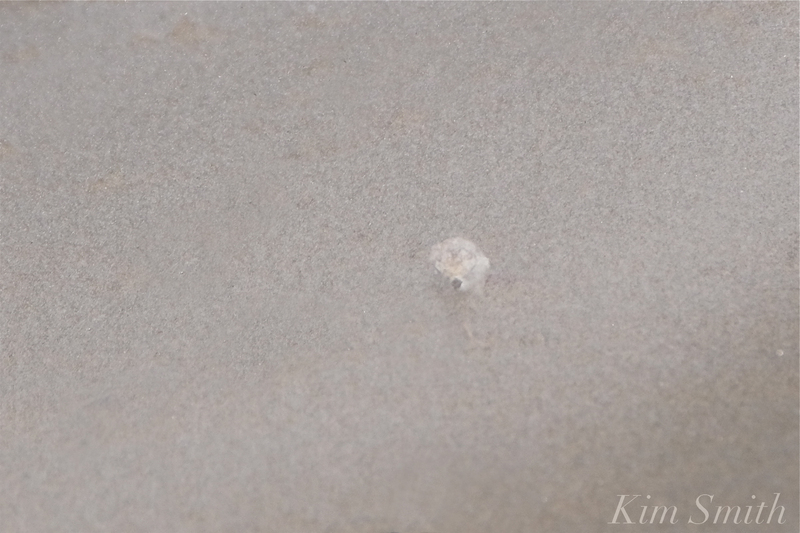 Throughout most of the day they were seen on the beach! Mama and Papa mating on the beach Wednesday afternoon. 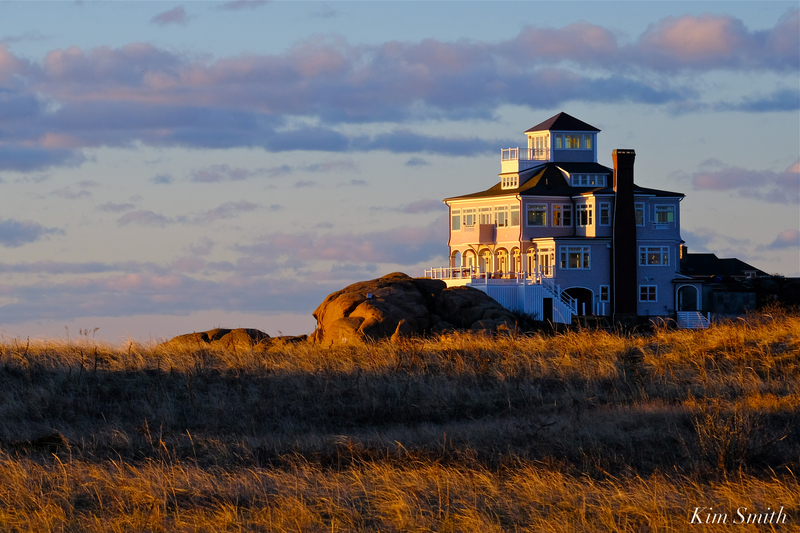 Aside from some pre- and early dawn scofflaws, along with the occasional visits by dogs off and on leash during the day, the beach appears to becoming less frequented by pets. Perhaps the beach will become the safer of the two locations and our little pair will decide to return for the duration of the season. THIS SUNDAY IS EASTER. IF THE WEATHER IS NICE THERE IS THE STRONG POSSIBILITY WE WILL GET PEOPLE FROM OUT OF TOWN, AS WELL AS SOME LOCALS, WHO ARE NOT YET AWARE OF THE ORDINANCE CHANGE. 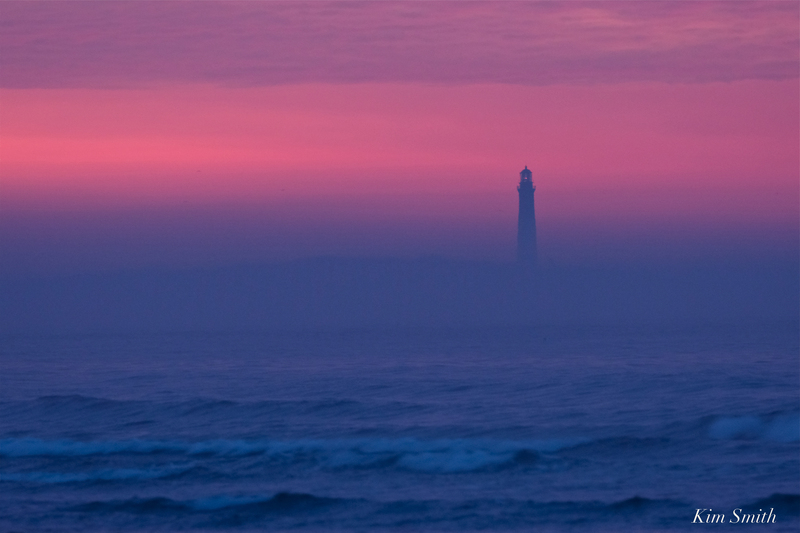 THE MONITORS WILL BE ON THE BEACH, BUT WE NEED HELP FROM THE COMMUNITY IN LETTING PEOPLE KNOW ABOUT THE NEW POLICY, NO DOGS ON THE BEACH AT ANY TIME OF DAY OR NIGHT FROM APRIL 1ST TO OCTOBER 1ST. THANK YOU FOR ANY HELP GIVEN! Thank you again to dog Officers Jamie and Teagan for their continued stepped up presence, and to Mayor Sefatia, Mike Hale and the DPW for the fantastic, clear simple signs. The past few days, the signs appear to really be having an effect! 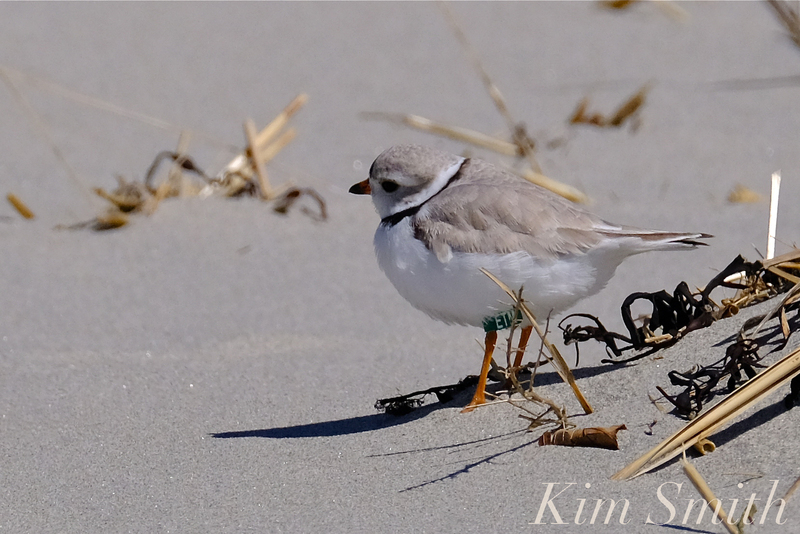 Banded Piping Plover ETM was observed again Wednesday. You can see his ETM leg band in the photo on the left, but not when he is standing with his left leg tucked up under his belly. 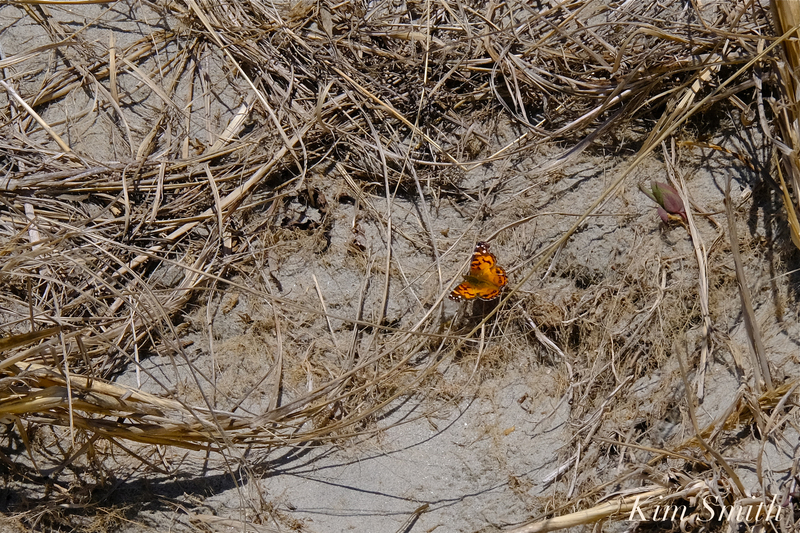 Painted Lady flying in off the water into the dunes. 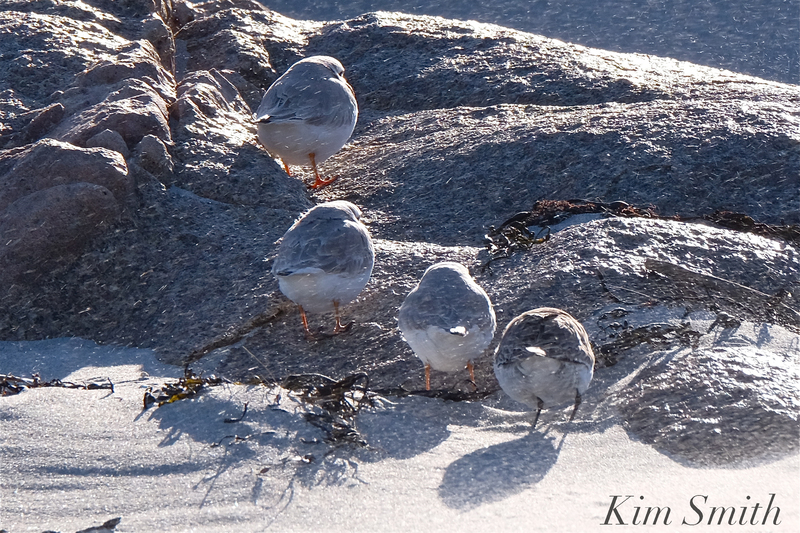 This entry was posted in #gloucesterplover, #sharetheshore, Birds, Birds of New England, Cape Ann Wildlife, Gloucester Plover, Good Harbor Beach, Life at the Edge of the Sea, Piping Plover, shorebirds and tagged #gloucesterplover, #sharetheshore, banded bird, Banded Piping Plover ETM, Beautiful Birds of Cape Ann, Charadrius melodus, Gloucester Massachusetts, Gloucester Piping plovers, Gloucester Plover, Good Harbor Beach, Painted Lady Butterfly, parking lot plovers, Piping Plover, Piping Plovers, Vanessa cardui, Virginia Tech Shorebird Program on April 18, 2019 by Kim Smith.